Purchasing a land property is both an investment and a risk to the buyer. It is an investment since the buyer can also sell the land in the future if ever there is an interested client or company who wants to build a property on top of his owned land. On the other hand, it is a risk since there will be tons of money to be prepared in order to use the land and maximize its purpose, especially if this particular land area is located far away from the city or main center of a town. Nonetheless, to buy a land legally, a land purchase agreement form must be constructed first by the involved parties who are the buyer and the seller. 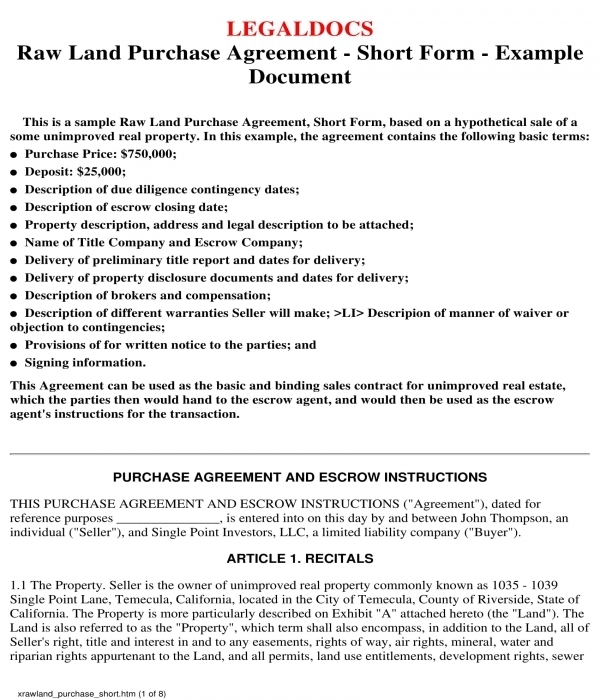 What Is a Land Purchase Agreement Form? A land purchase agreement form is a document which is to be used by individuals or organizations who will be transacting a land sale with a client or a prospective buyer. The agreement will lay out the expectations of the landowner or the seller along with the terms, conditions, and the pricing to be agreed on by the client. On the other hand, land purchase agreement forms are also for documenting the negotiated and approved requests of the client regarding the purchase that he will be executing in the land property. This document ensures that both the seller and the buyer have a documented understanding and have followed the legal steps towards accomplishing the purchase transaction. Raw Land Purchase Agreement Form – The term “raw land” refers to a land property which has not be improved by the owner or has not been touched or changed for any purposes and intentions. In a raw land purchase agreement form, the seller of the property will be able to indicate the purchase price of the property along with the required deposit price, the contingency and closing dates, as well as the description and location of the property. Other details to be included in the form are the name and title of the escrow company wherein the raw land property was enlisted, the list of legal forms and documents to be enclosed with the agreement, and the signing information of both parties. Specific Land Purchase Agreement Form – This variety of land purchase agreement form is suitable for parties who will be indicating specifics in their agreement and negotiation. The form contains five sections or points which are significant to be fulfilled by the parties involved. 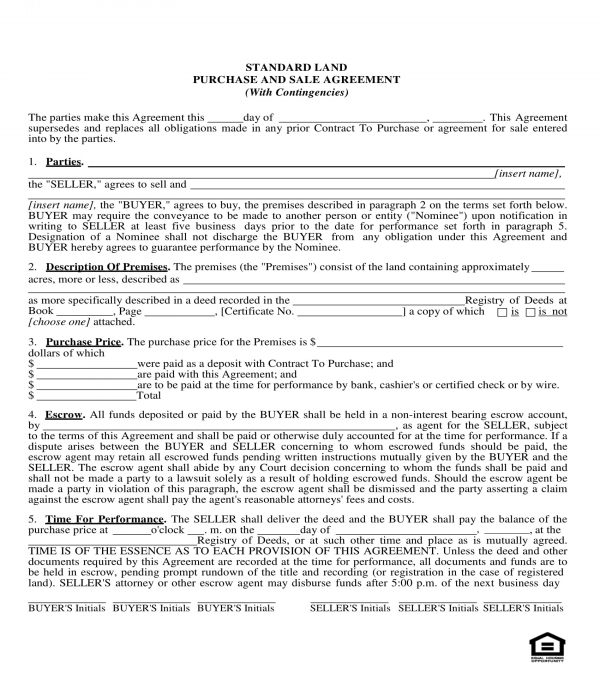 The first part of the form is the specific terms information section which will indicate the names of the buyer and the seller, the date of when the agreement was created, the financial information of the purchase, the expiration dates involved in the land sale, and the signatures of the buyer, the seller, and the broker who served as the witness and organizer of the land purchase transaction. The general terms of the agreement are stated in the second part of the form which should have further explanations and descriptions in relation to the purchase. 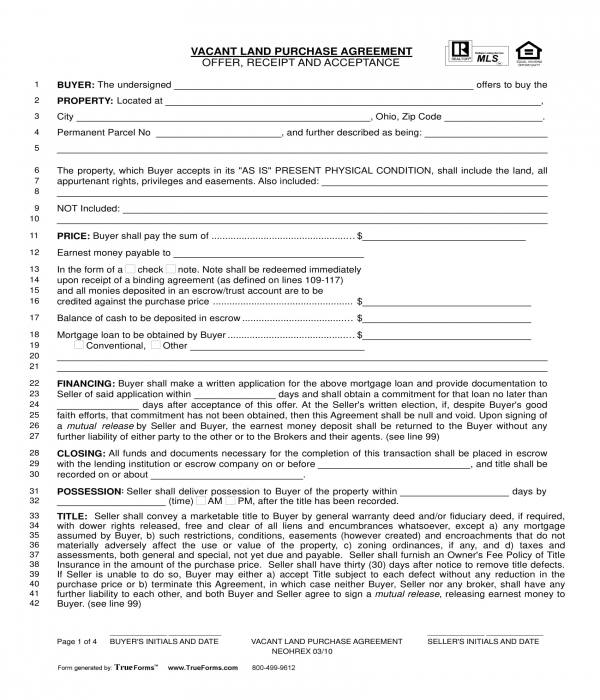 The third portion of the form centers on the addendum with the signatures of the buyer and the seller. The fourth part of the form is an escalation addendum to the purchase and sale agreement which is for documenting the agreement and negotiation of the buyer and the seller with regards to an increase in the purchase price in the event that a high offer is provided by another prospective buyer. The actual purchase price, the competing offer amount, the seller’s acceptance statement, and the new price purchase worksheet will be the factors to be incorporated in this section or portion of the form. An agency disclosure agreement is the center of the fifth part of the form which will highlight the roles and responsibilities of the agency broker with regards to the sale of the land to the buyer. 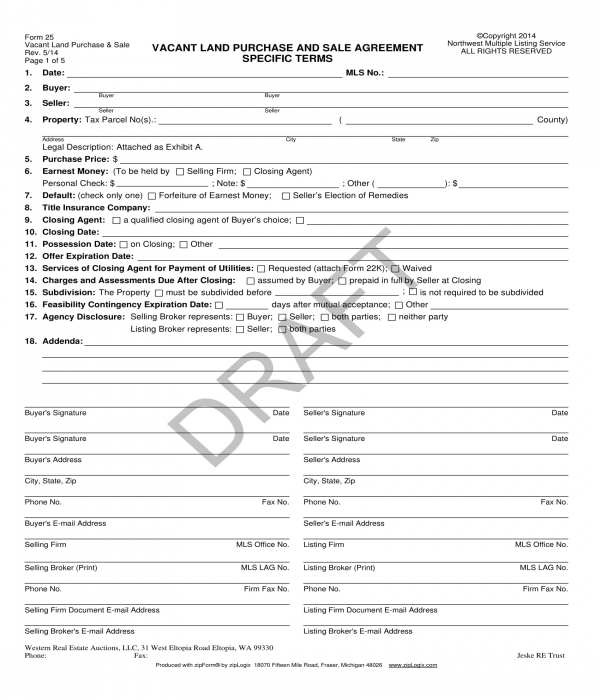 Vacant Land Purchase Agreement Form – This variety of land purchase agreement form serves as an offer document to the buyer, receipt form for both parties, and an acceptance agreement. The form is an offer document due to its content which indicates the offers of the seller to the buyer in connection to the land to be transacted, on the other hand, it is also a receipt as it contains the details of when the transaction and the purchase occurred between the buyer and the seller. Moreover, the vacant land purchase agreement form is also an acceptance agreement document as it indicates when and what the buyer has accepted in relation to his obligations tied in choosing to purchase the property such as his responsibility in supplying ample payments to the seller. The details of the commission payments and the names of the brokers involved in the purchase will also be listed in the acceptance agreement portion of the form. The agents’ names and contact information are essential to be stated in the form as well in order to ensure that the seller and the buyer are acknowledging the agents and will be able to contact them if their services are needed for any process pertaining to the land purchase transaction. Offer – This is an element or a content of the form which will define what the seller is selling to the buyer or his client. In addition, the offer will also have the details of the property with the inclusions of the sale. For instance, if there is a barn or a small house within the vicinity of the land area to be sold which is owned by the seller and yet had not been taken cared of, the seller must define in the agreement that it is included in the sale of the land area. On the other hand, the seller can also state in the agreement that all establishments or items found in the land area aside from the land will not be included in the sale or can be up for a negotiation with the buyer if the buyer is interested in purchasing it as well. Acceptance – The acceptance section of a land purchase agreement form must have a statement which will indicate the acceptance and the acknowledgment of both parties regarding their roles and their responsibilities. Additionally, a statement with regards to the buyer’s acceptance for the seller’s business proposal and offer for the land property to be sold should also be included in the agreement as part of the acceptance section. Legal relationship – Defining the relationship of the parties involved in the land purchase or sale is significant along with the definitions of their roles and obligations as well. By enlisting what each party is responsible for, there will be the effective dissemination of information with regards to the limitations and the expectations to be taken into consideration when executing the terms of the purchase agreement. Step 1: Indicate the title of the agreement along with a legal statement. The title of the agreement will be on the topmost portion of the form which should have the type of agreement that the parties are negotiating. Below the title can be a subheading statement which will allow the parties to know what they can expect in the agreement. For instance, if there are contingency statements in the form, then a “with contingency” subheading must be incorporated. After the title and the subheading is a legal statement which will begin the agreement. This statement will have the date of when the agreement is constructed and the place where both parties met in order to finalize the agreement for the purpose of the land sale purchase. Step 2: Disclose the general information of both parties involved. This section should have the full names of the parties who are the seller and the buyer. In the event that the either of the parties is a corporation, then the name of the company must be indicated in the form. Along with the names of the parties should be their individual roles in the agreement and whether there is a representative who will be representing the party in the agreement or not. Step 3: Describe the premises along with its conditions. The details of the premises ranging from its approximate measurement and the deed registration certification information will be stated in this portion of the form. In addition, the possessions and the conditions which can affect the sale of the land property must also be defined to assure the buyer that the sale is conducted without any violations and illegal matters that may arise after the sale and purchase is finalized. Step 4: Detail the payments. The purchase price for the premises is indicated in this section. This is also where the deposit for the purchase contract that the buyer provided will be stated with the amount that the buyer paid for the whole agreement and total payment amount that both parties have supplied for transacting the sale and legalization of the buyer’s purchase as well as possession of the land property. Step 5: Define the escrow agreement. An escrow refers to the specific amount of money which is assigned or held by a third party in an agreement on behalf of either the seller or the buyer. In the case of a land purchase agreement form, the seller is the party who will be assigning an escrow agent. The details of the escrow agent must be disclosed in the form such as the name of the agency where he is working in or his own name. Step 6: Indicate the time for performance and its extensions. This is where the seller and the buyer will be able to state the deadlines of when they will meet their obligations and responsibilities. For the seller, the date of when he will be required to provide or present the deed form to the buyer will be stated, while for the buyer, the date of when he must pay the amount of the purchase will be indicated in this section of the form. Other funds involving the purchase must also be specified in this section with regards to when it must be given to the appropriate person or party. Step 7: Enlist the title and plans for the purchase. Property assessment processes, zoning certificate acquisition, and other relevant procedures to be fulfilled for the land purchase of the buyer will be enlisted in this portion of the form along with the types of taxes which are yet to be paid or have been completed by the former owner of the land or property. Other inclusions in this section are the easement agreement and legal forms to be presented to the buyer and the authority as well as important matters to be discussed and disclosed during the property survey in the land area to be sold. Step 8: State the property insurance inclusions. A property insurance ensures that the owner of the property will be covered during specific events and incidents with regards to the property being owned. And since the land area will be purchased and be owned by another party who is the buyer, then the former owner of the property and the seller must settle the discussion about the property’s insurance policy and whether it will be included in the sale or if the buyer will be responsible for opening his own insurance account for the property after the sale. Step 9: Include a closing certification. This is to document that all closing forms and documents related to the property should be given or presented to the buyer. Step 10: Incorporate a deed acceptance statement. The main purpose of a deed acceptance statement is to indicate the choice of the buyer in accepting the land property and in paying the amount agreed by him and the seller for the purchase price and all other inclusive payments. Step 11: Indicate adjustments and addendums rules. A contract addendum can either be included directly in the form or be enclosed with the agreement in a separate sheet. However, to ensure that further contract addendums and arrangements or adjustments will be acknowledged, a section for detailing the rules with regards to its acknowledgment must be stated in this section of the form. Step 12: Add a statement for the acknowledgment of fee due broker. Since the broker is an important party to be involved in the process of fulfilling the land sale, then he should be able to receive payments for his services. The payment details and the agreements of the buyer and the seller with regards to the service payments of the broker will be stated in this section with the name of the broker as well as the indication of who will be giving the payments. Step 13: Define the buyer’s default agreement. A buyer’s default is important for documenting the actions which will be taken by the seller or the other parties involved in the agreement in the event that the buyer will not be able to meet his roles and responsibilities in the contract or the agreement. In this buyer’s default section, the buyer’s given payments and all amount which are included in the purchase of the land will be sent or directly given to the seller during the breach of the contract. Step 14: Detail the responsible party for the testing and surveys of the property. A property survey is one of the most significant procedures that any buyer must take note. This is when the land property will be checked and assessed by a licensed assessor to determine its compatibility with the buyer’s intents and its limitations as well. For this section, the party or the name of the party who will be paying the survey fees and payments will be stated along with the date and time of when the responsible party must submit the payments. Step 15: State warranties, representations, and notice agreements along with a signature block. This will be the last section of the form wherein the parties involved will be able to know how notice forms will be sent and what warranties or guarantees are included in the land purchase transaction. Below the warranties should be a signature block to cater the names and the signatures of the buyer and the seller along with the date of when they will be completing the agreement. Who Are Involved in a Land Purchase Agreement Form? Lender or financial sponsor of the buyer – Although not every buyer will be tapping the shoulders and support of a financial aid lender, there are some who will seek the services of a lender in order to meet the requirements of the seller of the property. This is the reason the lender or the lending company who is handling the finances for the purchase of the buyer should be informed about the land purchase agreement. The deed forms and all other documents which are related to the purchase of the buyer using the lender’s finances must be sent to the lender after the documents are signed and duplicated for all parties involved. Attorney – Both the buyer’s and the seller’s attorney and a notary public should be present during the construction of the agreement. The role of these legal authorities is to ensure that the parties; the buyer and the seller, will be aware of the different laws and regulations pertaining to the sale or purchase and will be able to meet the legal requirements of the State to fulfill a successful and effective land sale. Moreover, the notary public should be in the area where and when the buyer and the seller will be affixing their signatures on the form to document and prove the individual acceptance of the buyer and the seller to participate in the agreement on their own free will. Broker – The agency broker who is helping the land property owner to sell the land area to a client or buyer should be involved in the process and in the agreement. In the land purchase agreement form, the broker’s agency name and the name of the agent who is assigned to handle the concerns and needs of the seller or property owner will be stated in it along with a few contact information details to allow all parties to reach out to the broker agent whenever possible. Each party stated above have their own individual roles in the transaction which is why they must be inclined to the agreement and the purchase itself. Moreover, their concerns about the transaction of the buyer and the seller must be spoken out before the finalization of the agreement and the sale in order to ensure that each visible concern will be addressed immediately without further delaying the process. Nevertheless, each involved party must be informed of any changes and updates with regards to the land purchase as soon as a documented paperwork will be provided by whoever is proposing the changes.